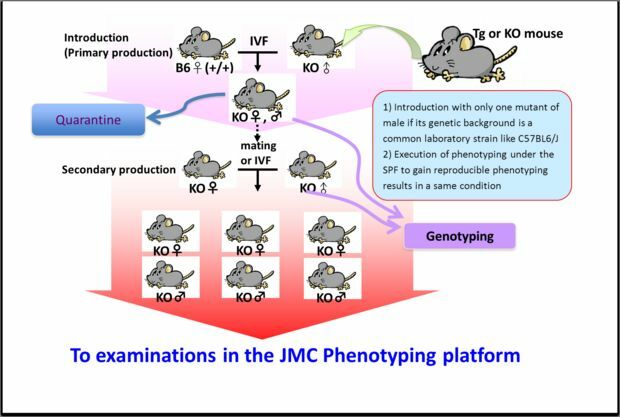 An agreement about rights and duties for phenotypic analysis data from your requested mice sources will have to be signed before the performance of Japan Mouse Clinic. Deposition or assignment of mice sources to RIKEN BRC requires another agreement. BioResource Center "Japan Mouse Clinic"
Pipeline 1 are designated to the comprehensive areas. This pipeline has composed by "Fundamental screen" and secondary "In depth screen". "Fundamental screen" is a package including the early (7-11 weeks old) 5 examination and pathology at 26 weeks old. Any examinations of "In depth screen" could be added. Pipeline 2 are designed as a set of behavior oriented screens. In the pipeline, behavioral tests are sequenced to reduce the effects of prior experiences independent from the pipeline 1. The detailed information of the phenotyping examinations is shown the page of the “Phenotyping pipelines”. Introduction is performed by IVF (in vitro fertilization) using fresh or cryopreserved sperm or cryopreserved embryo, because . After microbial monitoring, mice should be permitted to enter the SPF area, because we perform comprehensive phenotyping under the SPF in order to gain reproducible phenotyping results in a same condition. Screened mice will be produced after a few generations. After the completion of all examinations, we start the analysis of the results. The analyzed results and raw data are sent by E-mail. The contents can see by browsing applications in a client’s PC. About the details of the browsing displays, please refer to the page of “Pheno-Pub: Phenotype information database”.